Gougane Barra Hotel: Faulty towers in Gougane Barra? Faulty towers in Gougane Barra? 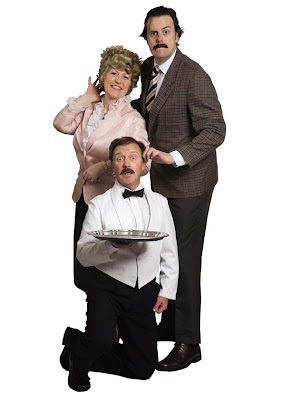 After a sell out six week tour of Ireland in 2009 Faulty Towers…the dining experience will be back in Ireland for 10 weeks in 2010. With most of the 2009 venues rebooking the show the available dates are already in short supply. Faulty Towers…the dining experience is a unique event offering the public a chance to find out what it would be like to dine at Fawlty Towers? There is of course the snobbish manic Basil; his domineering wife, Sybil; and their hopeless language-challenged waiter,Manuel. Give yourself the chance to be one of the steady stream of bemused guests trying to make Manuel understand what it is you want. Asking for an ice bucket ends up with you being presented with a 'nice bucket'. 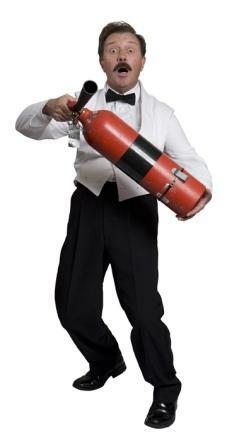 A simple procedure like opening a bottle of wine can become a huge drama. And, maybe, just maybe, in the middle of all these events, you might get some service, Faulty style, of course. Everything that can go wrong will……. In fact, this can best be described as organised chaos bundled into two hours of "fat-wobbling, gut-busting, face-aching laughter" whilst, AT THE SAME TIME, enjoying a fabulous three course meal. very limited amount of spaces left!